Julie Krupnick prepares to face a free-position shot. 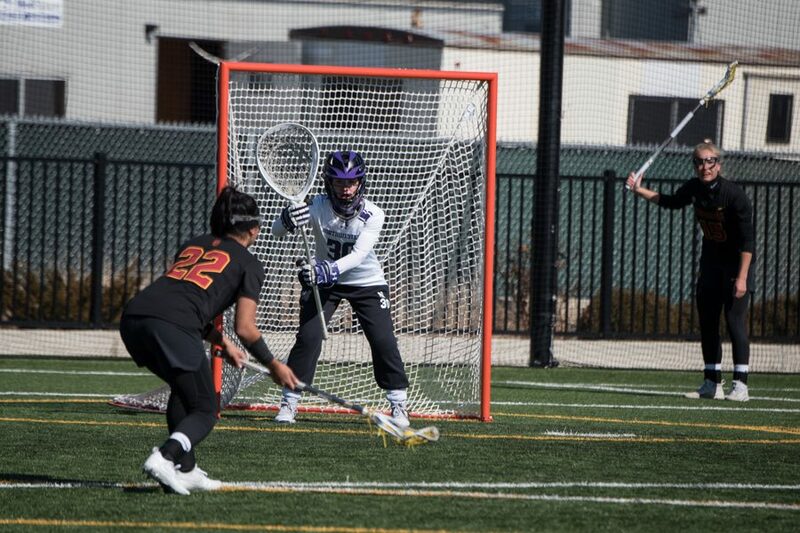 The redshirt freshman goalie allowed only five goals in Sunday’s win over USC. When Northwestern and USC met last season, the game ended in an 11-10 Trojans overtime win. Junior attacker Selena Lasota was injured in the loss and sat out the rest of the season, and the Wildcats proceeded to lose three of their next four games. Lasota scored three goals in the second half to propel No. 13 NU (4-1) to a 9-5 upset win over No. 7 USC (2-2). Senior attacker Danita Stroup added a hat trick, and redshirt freshman goalie Julie Krupnick finished with six saves and allowed only five goals on 20 shots. Coach Kelly Amonte Hiller praised the team effort in the win, noting contributions from Lasota, Stroup and Krupnick as well as from freshman midfielder Ally Palermo and senior attacker Shelby Fredericks. Palermo finished with two ground balls and two draw controls while Fredericks, an Inside Lacrosse Preseason First Team All-American who made her first appearance of the season Sunday, won six draw controls and scored one goal in her return. The Cats struggled with turnovers and a lack of offensive opportunities in the first half. NU committed 15 of its 24 total turnovers in the first; heading into Sunday, the Cats averaged 15 turnovers per game. NU took only 5 shots to USC’s 10 in the opening half. Lasota, the Cats’ leading scorer, was held scoreless for the first 47 minutes of the game. She said she used her quiet first half as motivation to persevere and continue taking shots during the second. The Trojans came out of the break swinging and scored two goals to take a 5-4 lead, capitalizing on NU’s fouls and turnovers. The tide began to turn midway through the second half when Lasota broke the 28-minute scoring drought and scored on her third free-position shot of the day to tie the score at 5. That goal began a 4-0 Cats run that saw two more goals each from Lasota and Stroup. On the defensive end, NU held the Trojans without a goal for the last 14:50 of the game and without a shot for the last 11:34. Sunday’s win over a Top 10 opponent was important, Lasota said, especially as the Cats come off last week’s 9-8 loss to No. 10 Duke and head into one of their most important games of the season next Saturday against No. 2 Stony Brook.